Retiring South Korean football icon Park Ji-sung bid adieu to fans in style, scoring a goal in his final match on Friday while getting a hero's farwell. Park, a former South Korean captain who announced his retirement in May, made his last appearance at the K League Classic All-Star Game in Seoul on Friday. He served as the captain of the team of active and former players, as they took on the K League All-Stars at Seoul World Cup Stadium. Park, who had earlier said he was worried about his conditioning, appeared fit enough to play some more at a high level. The one-time Manchester United midfielder was lustily cheered nearly every time he touched the ball by some 50,000 fans at Seoul World Cup Stadium. 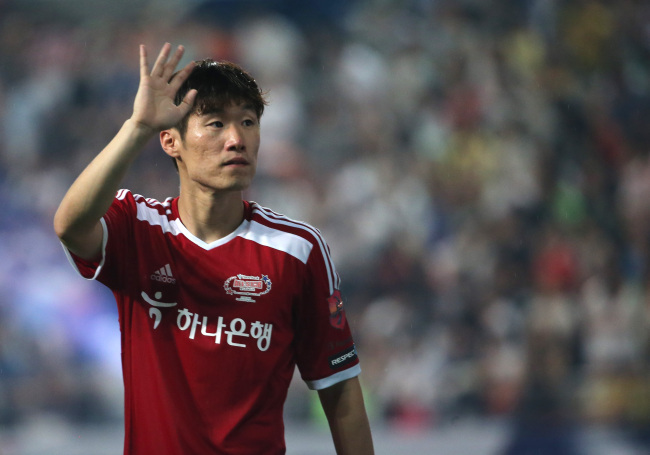 Park was substituted for Baek Ji-hoon at the half-hour mark and left the field to thunderous roars. Then, about 12 minutes into the second half, Park re-entered the match, much to the delight of the fans. Although a player is not normally allowed to re-enter a match after substitution, referees decided to grant a special exception to the retiring star. Park made the most of his second chance, scoring a goal in the 58th minute to draw his team even at 4-4 in the spirited match. Park then ran toward the bench and embraced his head coach for the night, Guus Hiddink. It was Hiddink who guided Park and South Korea to the semifinals at the 2002 FIFA World Cup, and the Dutchman agreed to serve on the All-Star bench to see off his former prized pupil. Park was later voted the MVP of the match. The teams ended in a 6-6 draw -- not that the result had much bearing on the celebratory mood of the night. His teammates paid tribute to the retiring star after their opening goal. After Kang Soo-il headed in a corner to give Park's team an early lead, the players lined up at the center of the field and presented Park with a wedding bouquet, in celebration of Park's wedding set for Sunday. Park announced his departure from football in May, citing debilitating pain in his surgically repaired right knee. He enjoyed a successful club career that began in Japan and took him through the Netherlands, England and back to the Netherlands. Park is the first South Korean to play in the English Premier League, having played for Manchester United from 2005 to 2012. After a brief stop at Queens Park Rangers, Park in the 2013-14 season rejoined PSV Eindhoven, the team he'd played for, with Hiddink as head coach, from 2003 to 2005. Internationally, Park played 100 matches, one of eight South Koreans with at least 100 caps. He represented South Korea at three straight FIFA World Cups starting in 2002, and scored a goal in all three. Park netted the winner in co-host South Korea's 1-0 victory over Portugal in the final group match in 2002, putting the country in the knockout stage for the first time ever. Four years later, Park scored the equalizer to hold the eventual runner-up France to a 1-1 draw, but South Korea couldn't get past the group phase in Germany. In 2010 in South Africa, Park was the South Korean captain, and scored the second goal in a 2-0 win over Greece, as South Korea reached the round of 16 for the first time away from home.